Arcen Games is pleased to announce the release of AI War: Fleet Command version 1.008. You can download a trial version of the game, as well as purchase a license key to unlock the full version. If you already have the game or demo installed, just hit "Check For Updates" inside the game to get the latest patch. More Free DLC: The primary upgrade in this release is improvements to the AI and how the players can interact with them. Planets on the galaxy map now show up as red (as seen below left) when the AI is likely to reinforce at them. This helps the human players avoid tipping their hand too soon and causing key AI planets to reinforce too heavily. Additionally, AI players will now reinforce their wormholes much like the human players tend to do. This makes deep raiding much more difficult and interesting, and requires many new tactics. In response to this, the human scouts are now much upgraded -- they all now include Cloaking, and most also now have a Cloaking Booster ability (as seen below right) that makes them even more effective in groups. - Capturable ships now are now only captured after a command station is finished being built. - Parasite costs have increased. - Waypoints can now be queued in conjunction with wormhole-movement commands. 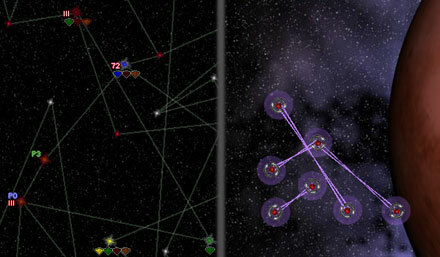 - Ships can now move between planets in attack-move or free-roaming defender modes. - Repair Stations and Mark II Engineers have had a range upgrade. - Cloaked ships will no longer auto-fire at enemy ships unless in attack-move/free-roaming mode. This helps them maintain invisibility on longer raids. - New Ship: Wormhole Command Posts are a perma-cloaked ship used by AIs to reinforce their wormholes. Kill the command station to kill these. - Scouts and EyeBots have been heavily upgraded to deal with the newer wormhole threats; they now all have cloaking, and most have a new Cloaking Booster ability. - Control group icons are now included in the planetary summary. - Mark II Science Labs and Missile Silos are now less expensive. - The range of all tachyon beam emitters is now higher. - The way the AI reinforces is now tech-level dependent (higher techs get fewer reinforcements). - Lightning Missiles have been made a bit more durable. - A new "AI Alert Level" is now shown on the galaxy map intel summaries, showing at which planets the AI is likely to do reinforcements. - Fixed several fairly rare bugs, including a multiplayer desync relating to attacking forcefields. - Fixed Astro Trains just hanging out at their stations. - Fixed a bug with AI players getting new ship types at too fast a rate. - Fixed a 1.007 bug where too many Advanced Research Stations and Data Centers were being created on maps 80 planets and up. The soundtrack from AI War has been widely praised, and with good reason. If you can't get enough of the music while playing the game, or you love the music but RTS games just aren't your thing, you're in luck: iTunes is now carrying the original soundtrack (OST) for the game! 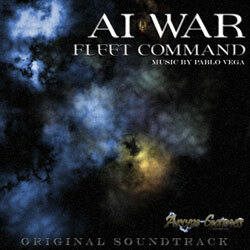 In the iTunes store, just do a search for either "Pablo Vega" or "AI War: Fleet Command." All of the proceeds from iTunes sales go directly to the composer. He did an awesome job, above and beyond the call of duty for any contractor, and we're really looking forward to bringing him on board as a fulltime staff member if AI War sales continue to be as great as they recently have been. In the meantime, we've left the rights for OST sales with him so that he can promote his incredible work beyond just the gaming community -- we're thrilled to see it now appearing on iTunes. Weekend Impulse Buy: 25% Off On AI War! This weekend only, you can get AI War: Fleet Command for 25% off the regular price at Stardock's Impulse store. AI War is already an incredible value, but this is a great chance to get it at an even lower price ($14.99 instead of the usual $19.99). Arcen Games is pleased to announce the release of AI War: Fleet Command version 1.007. You can download a trial version of the game, as well as purchase a license key to unlock the full version. If you already have the game or demo installed, just hit "Check For Updates" inside the game to get the latest patch. More Free DLC: A new transport ship (shown below) can now be unlocked from the DEF tab of your command stations. This transport is hugely useful for ferrying your weaker ships past heavy enemy defenses (across minefields, past ion cannons, etc). Transports can also be used for ferrying teleporting ships between planets (very useful, since teleporting ships were previously locked to their current planet). - Music streaming has been improved, which speeds up loading savegames and the game itself. - Suggested paths between planets are now much better. - Harvester ExoShields have been made more useful. - Fighters have been rebalanced, making them more useful. - Several new graph options are now available. - Overzoom is now an option. - Efficiency of drawing hundreds or thousands of ship attack ranges is now much better. - Multiple constructors can now be managed at once (space docks, missile silos, etc). - It is now possible to issue commands to ships still being built (which they will execute after completion). - Galaxy maps as small as 10 planets are now supported. - A new Auto AI Progress option has been added, allowing game pacing to be greatly adjusted. - Performance in very active games with more than 80,000 ships has been greatly improved. - Trial players can now play with full retail players for the trial duration (1 hour). - Waypoints now work better with attack-move mode. Two new reviews of AI War have now come out. Be sure to click the links to read the full reviews, if you're interested! We've also now set up a Press & Player Reactions page to aggregate reviews and player reactions all in one place. I can't recommend it any more highly to strategy fans and fans of space games in general. Innovative, absorbing and most importantly a hell of a lot of fun to play, AI War is the best indie game I've got my hands on so far in 2009. Challenging and multifaceted AI that increases in difficulty as you become more powerful, extremely large battles with lots of varied units that promote strategic variety, ample interface designed to handle a large scale. Continuing the series of articles about the AI in AI War. Takes a look at some of the limitations of emergent-style AI, and how those limitations can be overcome by combining the techniques proposed here with other styles of AI. Explores the heavily hybridized nature of the AI in AI War itself, and how AI for games in other genres might utilize some of the hybridized approaches -- but more importantly, where the boundaries of usefulness are for this approach (it isn't appropriate for racing or puzzle games, for instance). Arcen Games is pleased to announce the release of AI War: Fleet Command version 1.006. You can download a trial version of the game, as well as purchase a license key to unlock the full version. If you already have the game or demo installed, just hit "Check For Updates" inside the game to get the latest patch. Note: some people were having some trouble with the 1.005 installer, but that should be resolved with this release without the need for any external workarounds. Thanks to everyone affected for their patience with that issue. More Free DLC: Four new ships are now available for your use: Engineer II, and three new kinds of Orbital Command Stations: Mark II, Mark III, and Warp Jammer. These four new ship types greatly expand the economic options for players who want to customize their civilizations in that direction. The higher-level command stations provide extra resources, while the Warp Jammer command station provides a way to prevent all enemy warps into a few select systems (but at a steep ongoing resource cost). In addition to the new ships, this release also contains even more dozens of improvements, tweaks, and extensions based on player suggestions. This week's offering exceeds even last week's, we think. Thanks again to everyone who took the time to offer feedback -- and as a reminder for everyone whose suggestion made it onto the official to-be-done-in-DLC list, but didn't make it into this release, you should be seeing your ideas in play over the coming weeks. - New graphs in the scores display shows player progress on a number of metrics over time. - The online mini strategy guide has become a more comprehensive wiki. - Various improvements to the score screen display. - Tooltips for starting ship types in the lobby, and other minor lobby enhancements. - Even more galaxy map display modes, filters, and control options. - Holding the I key now shows the Hit Percent and Damage for all selected ships. - Savegame performance improved 5x for large games (60,000+ ships) in particular. - AI Progress now uses a scale 10x higher than it was previously, and Astro Train Station and Special Forces Command Post destruction now has a minor increase to AI Progress. - Several AI behaviorlets have been added for making it more intelligent in a few specific cases. - Several improvements have been made to make the game more friendly to Turn-Based Strategy (TBS) players. - Dozens more smaller improvements, tweaks, and extensions suggested by players. See full release notes for details. Discusses the developer's experiences in MDX, XNA, and SlimDX, and why SlimDX was ultimately picked over the other options for AI War and all other planned Arcen Games titles. Continuing the series of articles about the AI in AI War. Takes a look at some of the actual LINQ queries used by the game, and addresses a few common criticisms that came up to the first article. This article is intended more for programmers or AI enthusiasts, whereas the first article was multi-audience. Arcen Games is pleased to announce the release of AI War: Fleet Command version 1.005. You can download a trial version of the game, as well as purchase a license key to unlock the full version. If you already have the game or demo installed, just hit "Check For Updates" inside the game to get the latest patch. More Free DLC: Three new ships are now available for your use: Science Lab II, Mobile Repair Stations, and Counter-Negative-Energy Turrets. Each provides interesting new strategic capabilities. As helpful as these new ships are, however, they almost pale in comparison to the vast number of other updates and enhancements in this release. This release contains dozens of improvements, tweaks, and extensions based on suggestions from over ten players. Thanks to everyone who took the time to offer feedback so far -- and for everyone whose suggestion made it onto the official to-be-done-in-DLC list, but didn't make it into this release, you should be seeing your ideas in play over the coming weeks. - The game now supports smaller galaxy maps in addition to the existing sizes. - Many new settings options, including better support for windowed modes. - Many, many new display modes available in galaxy view. - Ship borders now flash in far zoom when they take damage. - Minimap enhancements, including minimap display modes. - Icons for important enemy ships are now shown in the Intel Summary of the galaxy map. - Minor planetary summary (the palette on the right side of the screen) improvements. - Ship autotargeting is now much improved. Overkill is a thing of the past. - The AI now acts a little bit smarter at guard posts, retreating more often when needed. I checked out the demo last week and came away surprised just how deep this game is. The game isn't for the faint of heart when it comes to strategy. Thankfully there's a full tutorial available to walk you through the game. The cooperative mode feels very robust, but you'll definitely want to use some sort of voice chat software because there's so much stuff to communicate. Head over to Co-Optimus for the full post. AI War Comes To GameTrove! AI War is now on GameTrove, an indie-focused game site! Takes a look at the design philosophy behind the AI in AI War, and looks at ways in which emergent behavior and other modern AI techniques can be used instead of traditional decision trees. If you're wondering how we made such an intelligent AI, this provides a good overview. Arcen Games is pleased to announce the release of AI War: Fleet Command version 1.004. You can download a trial version of the game, as well as purchase a license key to unlock the full version. If you already have the game or demo installed, just hit "Check For Updates" inside the game to get the latest patch. More Free DLC: Two new ships are now out in the galaxy for you to encounter. Both of these ships are quite challenging to deal with, so only show up on the advanced difficulty levels. Next week's DLC will have ships for everyone, never fear -- but other major features for everyone in this week's DLC include a variety of control enhancements, and a new "No Enemy Waves" AI Modifier. There are also a couple of bugfixes: if you were having trouble loading savegames in the trial version of the game, or if you had a larger screen resolution and game fonts looked chunky or fuzzy, this version fixes those issues. The first new unit, shown right, is PermaMines. These mines work like regular mines, except that they cannot be destroyed by being shot or by being collided-with (though they will kill that which collides with them). These mines also don't have cloaking, and you will only occasionally run into these on the higher difficulties on AI planets. These mines create some interesting strategic challenges , as you can only get past them with EMPs, luck (sometimes ships don't set off mines they pass -- the smaller and faster the ship, the more likely it is to slip past), ships with Mine Avoidance (builders, engineers, raiders, etc), or by going around the PermaMined wormhole. The second new ship is the Core Starship, a terrifying haunt of some core and home AI planets on the "HARDER" AI styles (so, regardless of what AI difficulty you play on, AIs like Technologist Homeworlders and Backdoor Hackers will have a chance of having Core Starships. These starships have a lot more health than any other starships, and a powerful primary attack. The best strategy with them is perhaps avoidance -- you can set up decoys and distractions to keep them busy while you complete your real objectives. Of course, you could opt for a full-on assault against them, too, but just be prepared for a long and difficult battle unless you bring along something like Mobile Force Field Generators to protect your units. There are other strategies that work, too -- experiment and see what fits for you! There are three key control/interface enhancements included in this week's release, all suggested by canny player Maxim Kuschpel. They are: group move, free-roaming defender mode, and the ability to press the L key and divide your selected forces in half (by numbers of selected ship types). You can read more on these new features in the controls document -- press escape and then hit View Controls from the in-game menu while you are playing. In a nutshell, Group Move lets you move a batch of selected ships which may have differing speeds all at the same speed (the slowest speed). This is great for having fighters, bombers, and cruisers all reach an attack target at once, or for having faster ships guard a smaller, weaker, ship such as a Science Lab or Colony Ship that is on the move. To put ships into this mode, either hold the G key while giving them movement orders, or use the new button at the bottom of the HUD (Lone vs Group movement style toggle). They will show up with a turquoise border in far zoom while in this mode. Free-Roaming Defender Mode lets you easily defend your planets. In past versions, if a couple of small ships got past your wormhole defenses, you'd have no choice but to hunt those down manually, which required more micromanagement than was always pleasant (that really emphasized wormhole defense, but perfection is not always possible). By holding V and right-clicking anywhere, you can put your ships into the new Free-Roaming Defender mode, which gives them a pink border in far zoom, and makes them chase and attack any enemy ships on the current planet. Setting some of your ships in this mode is great for letting them take care of any stragglers that slip through your defenses, without you having to manage it. Since you specify the parameters of the Universe you play in, there are a lot of replay opportunities and the degrees of AI difficulty and play style will also further add to that, so you're getting a lot of indie-fuelled strategic play for your $20. But you are also encouraged to become part of the AI War community, and participate in its future evolution and development. With DLC already being rolled out regularly, and a planned expansion in the works, you too could be a part of its emergence. Head over to UKGamer for the full review. Primarily a technical article, discusses the methods by which such huge unit counts and such intensive AI were achieved. Especially notable since the game is coded in C#, rather than C++.